The V4X leverages the power and flexibility of our next-generation show control core to deliver a perfect solution for everyday show control applications. 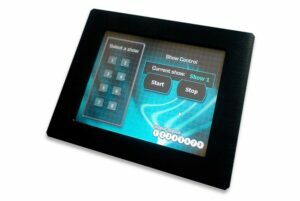 This product includes many of the core features that demanded by attraction systems, including multiple Ethernet ports, serial, digital I/O, and a built-in LCD panel display. 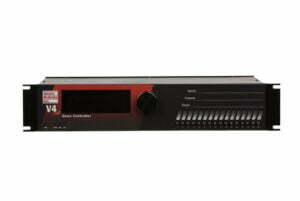 This makes the V4X an ideal solution to control medium-sized attractions or show control sub-systems. 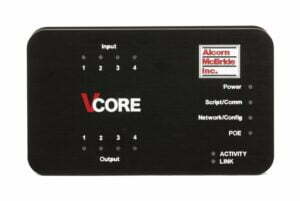 For applications that do not require the advance external synchronization features delivered by the SyncCore technology within the V16X, the V4X offers the same advanced show control features in a more economical package. It provides seamless integration with common devices such as PLCs, DSP cores, display devices, motion control systems, and A/V components. The V4X is not a computer. Its purpose-built design means it is capable of running your attraction with perfect consistency and absolutely no maintenance throughout the life of the attraction. With products like this, it’s easy to understand why the best attractions in the world have been relying on Alcorn McBride to run their show every day for the past 30 years.